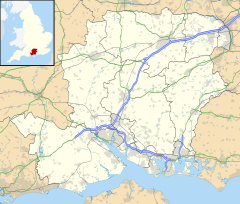 Wootton St Lawrence is a small village in Hampshire, England, 2.5 miles (4.0 km) west of Basingstoke. The name is derived from the Old English wudu tun meaning woodland settlement or farm. The manor of Wootton (see Manydown) was a possession of the prior and convent of St. Swithun from the time of the Domesday book until the dissolution of the monasteries. The Dean and Chapter of Winchester sold the manor to William Wither in 1649. However, the manor was reclaimed by the church after the restoration and the family received no compensation. The manor returned to the family after the purchase by the Reverend Lovelace Bigg-Wither in 1863, but he sold it to the Bates family 10 years later. Wootton oak timber was used to reconstruct Winchester Cathedral nave c. 1390 by William of Wykeham. Wootton St Lawrence is a civil parish with an elected Parish Council and falls within the local government district of Basingstoke and Deane, part of the shire county of Hampshire. On 1 July 1966 the East Oakley ward of Wootton St Lawrence Parish Council was added to Oakley Parish Council, with elections in May 1968. The village has a church named St Lawrence and the village is often regarded to its name. The mediaeval church was rebuilt in 1864, retaining the 12th century north arcade and tower and some of the 14th century windows. ^ "Wooton St Lawrence". Key To English Place Names. English Place Name Society. Retrieved 9 May 2012. ^ "HantsWeb - Wootton St Lawrence". Retrieved 23 August 2010. ^ "Wootton St Lawrence Parish Council". Retrieved 23 August 2010. ^ "Oakley and Deane parish council - history". Retrieved 23 August 2010. ^ The Illustrated Encyclopedia of Beekeeping, Roger Morse and Ted Hooper, 1985, E.P. Dutton, Inc.